The BaduJet Imperial SwimJet System complete consisting of Dual Jet Nozzle Housing, Adjustable Flow Nozzle, LED Light, Stainless Steel Ring Cover, Stainless Steel Hand Rail, Massage Hose, 4 HP Pump Model 21-80/33GS and Control Box. Flush mounted, plastic housing, 16” diameter. 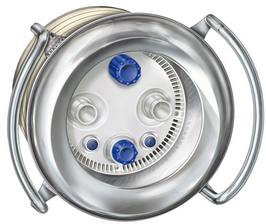 Stainless steel 19" round anti-entrapment cover provides undetectable suction. Adjustable recessed dual jet nozzles. Volume control knob to adjust the flow of water. Pneumatic on/off button guarantees complete separation between pool water and pump motor control. Air regulator adjusts amount of air bubbles in water flow. Speck 4 HP self-priming, plastic pump. UL Listed, single phase with thermal overload (no motor starter required). Massage Hose with pulsator may be attached to jet nozzle.